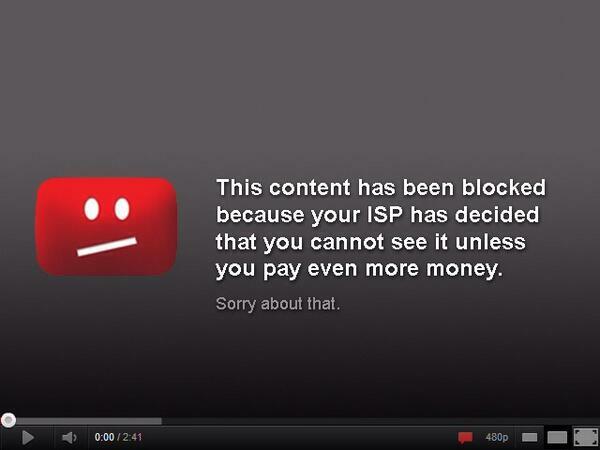 Net neutrality died yesterday. Welcome to the commodified, censored, spied-on corporate web. But… doesn’t it seem kind of the same as it did yesterday? Yes. The corporations who gave Ajit Pai nearly three quarters of a million in grubby, brown-envelope cash to kill net neutrality aren’t fools. (Look how cheap they bought him for.) They’re not going to ruin the net right away, all in one big slash. Look for lots of little slices instead, each one protected by a bodyguard of hired bullshitters and smiling lawyers telling everyone what an exciting opportunity this is. What will the first blows look like? Peering is when one network agrees to carry another network’s traffic. All networks do it because none of them owns enough network to provide a satisfactory service by themselves, which makes you think how cool it would be to have one set of rules that put users first governing the whole network. But Ajit Pai’s employers at AT&T and Verizon don’t agree, so here we are. Paid peering is when a network receives a consideration for carrying another network’s traffic. That’s going to happen a lot more now that cable companies can throttle data and hold companies, as well as individuals, to ransom. Expect to be offered the chance to pay extra to be allowed to see things you’ve always seen before for the same flat fee, but don’t expect it to all come at once. Zero rating will likely happen first. Zero rating is a kind of inverted paid peering; AT&T, for instance, will let you watch cable TV on your phone, without counting it toward your data plan – if you buy your cable from AT&T. Since this essentially adds up to a consumer-friendly freebie, thus far most people don’t mind it. But that’s about to change. The first step to a fully commodified internet – one where access, not just content, is charged for – will be fragmented phone and internet bills that will start to look more like cable bills. Down the line, we can expect to see telcos doing deals to offer faster service to some businesses, websites, and maybe even locations, at the expense of others, as well as throttling access to competitors. The result will be an internet of paid walled gardens, each farming its captive audience. And make no mistake: in a nation of 325 million, 125 million – or two in five Americans – has no choice of broadband provider at all. Boy, I just can’t wait to serf the web. It’s not all doom and gloom. There are continuing battles at state and local levels to establish net neutrality states, including some really technically innovative stuff as well as principled city and state leaders making a stand for their constituents. And there are things you can do too. First among which is, get a VPN and use it!